And in Kabumpo, Thompson explicitly ties the knight to Arthur: “Yet the knight was so old that it would give me lumbago just to try to count up his birthdays. He dated back to King Arthur, in fact, and had been wished into the Land of Oz centuries before by an enemy sorcerer.” So he’s from medieval England, right? Well, not according to Yellow Knight, which explains Hokus’ past in detail, but doesn’t entirely match up with what we’re told in earlier accounts. And yes, I had thought there were other mentions of Hokus being from Arthurian England, but I couldn’t find any. Thompson actually becomes somewhat more vague about the matter after Kabumpo. Cowardly Lion just refers to him as “a knight so many centuries old that only in Oz could he be alive at all.” Lost King establishes that there might be some mysteries wrapped up in the knight’s past. Thompson writes, “Dorothy and Ozma, remembering Sir Hokus’s strange history, felt that he might easily be the lost King of Oz.” Perhaps she was starting to consider delving into Hokus’ back story, but I’m not sure how he could have been Ozma’s father if he’d lived for centuries in Pokes. The knight is somewhat forgetful when Dorothy meets him, however, and his own account of how he ended up in the sleepy town could be a planted memory. Gnome King gives Hokus’ age as seven centuries, presumably meaning he was born in the thirteenth century. Geoffrey of Monmouth placed King Arthur’s reign in the sixth century, but later details of the Arthurian legend, like the knights in armor with a code of chivalry, match up more closely with the thirteenth. Of course, Arthur couldn’t have been the ruler of England during a time when we have detailed historical records of the monarchs. T.H. White purposely joked on the anachronisms in The Once and Future King, but I don’t know if Thompson had any opinions on this matter. Not that it makes much of a difference for our friend Hokus, however, as Yellow Knight makes it clear he’s from Oz in the first place. As per Yellow Knight, Hokus’ real name is Corum, the Yellow Knight of Oz and Prince of Corumbia. Yes, Thompson had a thing for making all her characters with mysterious pasts turn out to be royal, but some of of the Knights of the Round Table were as well. He was on his way to the neighboring kingdom of Corabia to compete in a challenge for the hand of Princess Marygolden. The Sultan of Samandra, fearing an alliance between the nations, transformed everyone in both kingdoms. He was also the black knight and sorcerer who banished Corum to Pokes. His stay there is confirmed as having been about five centuries, which means he was around 200 years old when he set out from his father’s castle. If his recollection in Royal Book that he has “never had a real adventure–never killed a dragon–nor championed a lady–nor gone on a Quest” is accurate, it leaves the question of why he waited so long. It also implies that the Corumbians were already really long-lived at this point, despite other suggestions that Ozites aged at what we would consider a normal rate until around the time of Ozma’s ascension to the throne. He also claims while in Pokes that he’s never heard of Oz and expresses surprise at the Lion talking “quite manfully” even though his horse is revealed to have been able to talk. He remembers the sorcerer-sultan as having shouted, “Live, Wretch, for centuries in the stupidest country out of the world,” while in Yellow Knight he remembers it as “Live, wretch, for centuries in the stupidest Kingdom in Oz.” Is his memory coming back or getting more confused? At the end of the book, Corum is restored to his old self, including regaining his youth. (Strangely, that last sentence is not a contradiction.) As fans have pointed out, a young knight doesn’t have the potential as a blustery, constantly frustrated old knight. Royal Book presents him as a man out of his element, seeking to fight dragons and giants but rarely getting to. There’s a bit of Don Quixote about him, except while Quixote lived in the mundane world and encountered windmills when he expected giants, Hokus instead finds a childish giant made of candy and an ancient, tame dragon who doesn’t put up a fight. He becomes more used to modern Oz in later books, even picking up some American slang from Betsy Bobbin and Trot, but continues to always have the desire to go on quests and fight monsters. Thompson rarely used him after his disenchantment, although he does make a visit to the Emerald City in Wishing Horse and is mentioned a few other times. John R. Neill does use him, but pretty much ignores Yellow Knight, instead giving the character his old name, appearance, and personality. 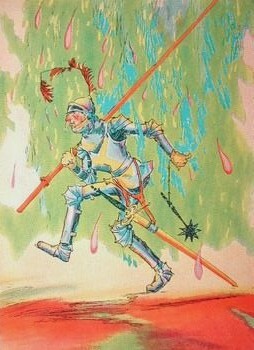 Thompson herself seems to follow suit in Yankee, in which the character is only called Sir Hokus during his brief appearance, never Corum or the Yellow Knight. This confused me when I first read the books, but perhaps the simplest explanation is that he aged a bit and grew back his mustache after Yellow Knight. J.L. Bell’s suggestion is that fatherhood might have been what drove him back into old habits. Whether Corumbia has anything to do with Arthurian England remains to be seen. Maybe it was settled by members of Arthur’s court who discovered some way into Oz. I think it’s pretty clear that Hokus himself never actually lived in England despite some evidence to the contrary, however. Then again, there ARE those mysterious 200 years before he was sent to Pokes. This entry was posted in Arthurian Legend, British, Characters, John R. Neill, Mythology, Oz, Oz Authors, Ruth Plumly Thompson and tagged anachronism, corabia, corumbia, cowardly lion, don quixote, dorothy gale, dragons, geoffrey of monmouth, giants, kabumpo in oz, king arthur, knights of the round table, ozma, pokes, prince corum of corumbia, princess marygolden of corabia, samandra, sir hokus of pokes, sultan of samandra, t.h. white, the cowardly lion of oz, the gnome king of oz, the lost king of oz, the once and future king, the royal book of oz, the wishing horse of oz, the yellow knight of oz. Bookmark the permalink. Well, with The Royal Book of Oz being in the Public Domain, I could see this cat in Book III and IV. Perhaps even in Book II and the “Mother of all Meltdowns” chapter. Nice exploration of Sir Hokus of Pokes. I wish I liked the original character enough to want to see more done with him, but I actually prefer him restored to his old younger self. I found him annoying overall when he was the doddering old git trying to kill everything that didn’t conform to his prototypical colonialist, imperialist, speciest worldview. 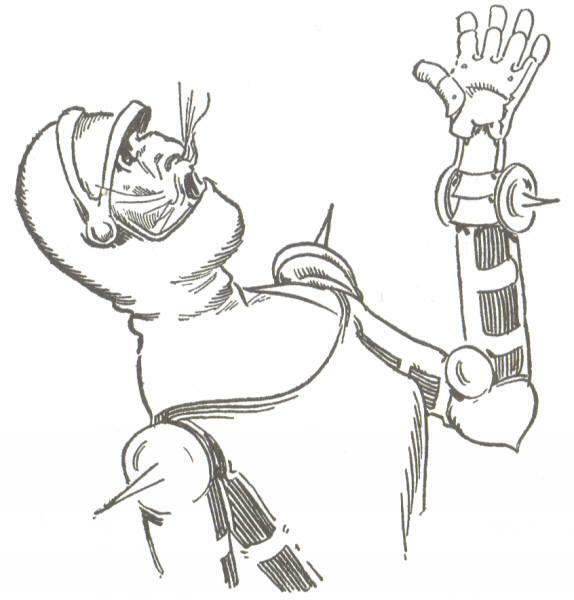 And having him take center stage when characters like the Tin Woodman went completely unused didn’t help. Thompson did introduce a number of endearing characters that I’d have liked to see her do more with, Snif the Iffin, Snufferbux, Carter Green, Grumpy, Chalk and Skamperoo; heck even Notta Bit and Bob-Up (though I’m in the minority), but for my tastes Sir Hokus wasn’t one of them (neither was Grampa, but she thankfully doesn’t do anything more with him). I think he *could* have been a fascinating character had he been pitted as a contrast to Ozma or the Tin Woodman, but that would have required Thompson having the foresight to actually recognize that they represent two opposing worldviews, or to even consider her books from a character POV instead of a constant-action focused one that had to appeal to children. But she turns Ozma into such a weak, ineffectual, spineless character that such a possibility is never even hinted at. 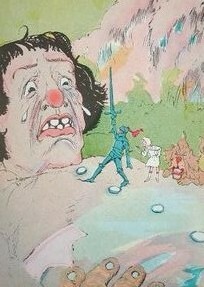 Sir Hokus is automatically appointed her knight, forgetting that Ozma has no need of knights, as her Royal Army is a single man who has a flower in his gun instead of bullets, which is indicative of Ozma’s stance against violence; her sole gaoler is a woman who keeps prisoners in her own cottage and treats them with love and respect, indicative of Ozma’s rehabilitative stance on punishment. THAT Ozma, the one of The Emerald City of Oz, who would rather sacrifice her life than to adopt the violent ways of her adversaries, doesn’t exist in Thompson’s Oz. Had that Ozma existed, her perspective on Hokus going around looking to kill giants and dragons would have sat very differently with her. And that’s a story I’d like to read. Well, to be fair, Hokus rarely gets the chance to actually engage in the violent swordplay he desires, which just adds to his general frustration. Aside from the Gheewizard’s dragon, about all I can remember is his knocking guards around in Yellow Knight. Ozma and her friends rarely try to talk him out of it, though; they just usually solve things in other ways before he gets the chance. There are definitely problems with his worldview, but I find his dialogue so fun to read that it somewhat makes up for that. I’m not really sure I buy Ozma being weak in the Thompson books, at least not in how I generally think of the word. It’s more that she comes across as considerably more vindictive than she generally did in Baum. Perhaps “ineffectual” is a better word. She lacks the forthright and principled qualities that we see of her, say in Glinda of Oz, where she’s determined to help a far away community at any cost (and against the advice of Glinda), or Ozma of Oz, where she treks all the way into another country to save the Royal Family of Ev, or in The Road to Oz, where she’s so incensed at the idea that Eureka ate a piglet that she has a trial for the cat, or in The Emerald City of Oz, where she determines to die rather than utilize the violent methods of her enemies to defend the city. Even Little Wizard Stories of Oz has Ozma determining to travel Oz to better get to know her people and see what their needs are. Whether one agrees with her positions or not, Baum’s Ozma was active and highly principled, but she could also let her hair down and play games with the girls. Thompson’s Ozma seems to ONLY do that. She’s lost all of what makes Ozma Ozma and is reduced to little more than playing games. Couple that with her sudden vindictive streak, which is extremely unOzma-like (even at her angriest she was still willing to give Eureka a trial). It’s a significant character change, and not for the better, IMO.